Your Fido will be delighted to do tricks if any of the following treats are his reward. According to our panel of dog biscuit experts — Zach, Zoey, Red, Denny and Joey — the best find of the season was the Pumpkin-Liver Cookie from Whole Dog Journal’s September 2012 issue. A simple, two-ingredient treat, it got rapt attention from our experts. Excellent for training. Most dogs love liver, but it can be rich for some. 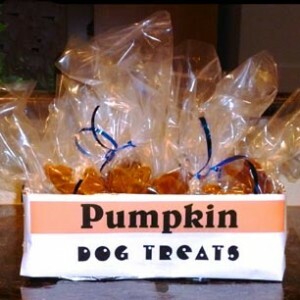 The pumpkin helps hold the cookies together, has a flavor that most dogs love and is easy on their digestive tracts. Preheat the oven to 325 to 350 degrees F.
Combine the two ingredients well. Spoon drops of the mixture onto parchment paper lining a cookie sheet. Using the bottom of a glass, flatten the drops to an equal height so they bake evenly. Bake for about 20 minutes, or until firm enough to handle. (Take note: they have a liver odor as they bake. Take them out of the oven and cut the cookies into the right size for your dog, then continue to bake until they are dry. Store in the the refrigerator or freezer. Beat the egg in a medium bowl. Add all of the remaining ingredients and stir until well-blended. Drop single teaspoons of the batter onto a lightly greased baking sheet about 1/2 inch apart. Bake until lightly browned (about 20 minutes for a soft, chewy treat or 25 to 28 minutes for a crunchier treat. Can be stored in the refrigerator for up to two weeks or the freezer for up to two months. Makes about 50 treats. One of our favorite pumpkin dog treats is Cesar Millan’s Pumpkin Puffs. Can I make frozen treats for dogs?